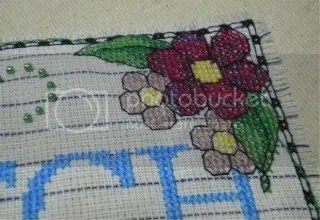 It was a friends birthday on Thursday so I had to stitch a card 🙂 I found it hard choosing a motif though and in the end settled on a little rose from one of the latest Crossstitch Collection magazines. 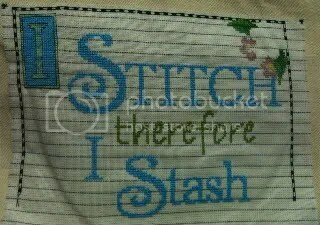 As usual I left it quite late and was speed-stitching so she could actually receive it on her birthday. My cross stitch stash is quite limited so it was lucky that I had the necessary floss colours, well it’s because of Rose Dreaming really as that project has about 50 shades of pink if not more. I wasn’t quite as lucky with the greens so I went with a different green, avocado green instead of whatever the charted one was. 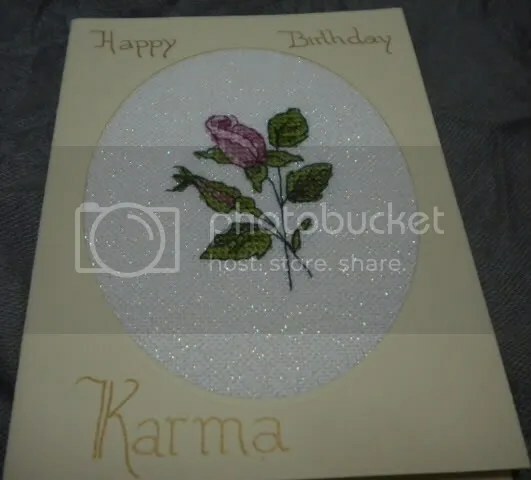 It turned out rather well if I do say so myself, I used the pearl-flecked white 28-count brittney evenweave for it, just to add some extra bling. 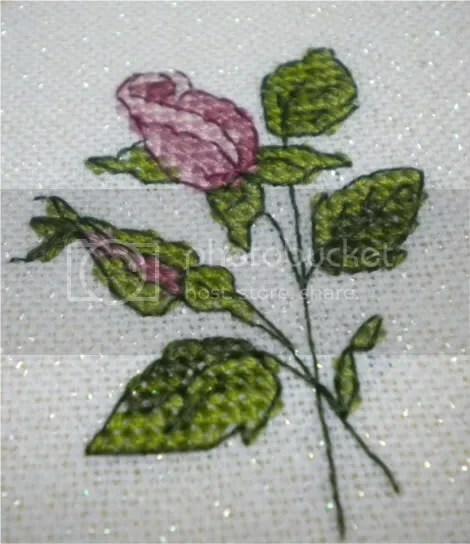 Here is a close up of the rose, should also add this is the first time I’ve stitched over two on evenweave and it was really confusing at first but then got easier. Actually I finished the whole thing last week, but haven’t been on a ‘real’ computer since the last update so couldn’t resize pictures etc. These pictures are all pre pulling the canvas out, but with the beading and everything. I’m really happy with it, it was definitely worth the sore fingers. The only thing I have left to do now is wash it (carefully, since i have used a few hand-dyed cottons on it) and iron it (again, carefully since I decided beads were the way to go), think it should be ok though if I iron on the back with it on a thick towel. Fingers Crossed. And here we are with the swirly backstitch and beading done, both of which were a pain, but it looks quite good once the canvas was pulled (you’ll get pictures of that next week). But I love the floss I used for the flower petals, the small flowers are Dragonfloss Tea Rose and the big one is Pomme de Pin Pimprenelle, both hand-dyed cottons. The Pomme de Pin is one of three skeins I recently won in a blog giveaway (thank you, Claire93), and this is the first time I’ve used it. 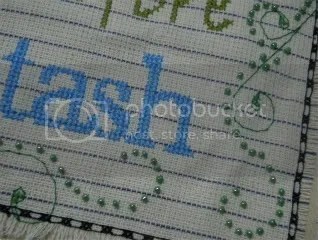 I have more projects lined up to try them out on though, the Pimprenelle was great to stitch with. Next week (or maybe in a few days if i have the time) I’ll unveil it without the canvas, it looks great, if a bit creased right now. How cute can you get? 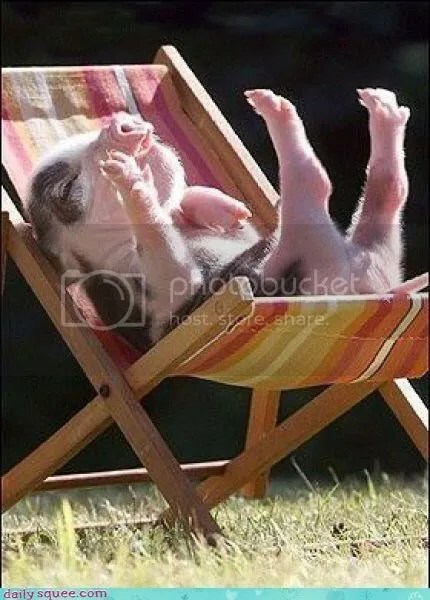 Of course I won’t be getting one this birthday ( aka TOMORROW) since live pigs are illegal here in the UAE, but hubby has promised we can get one once we are back in the UK if we find a place to live which is suitable for animals. They are a bit expensive though, but a quick google search revealed that there are always some available ‘second-hand’ as it were. 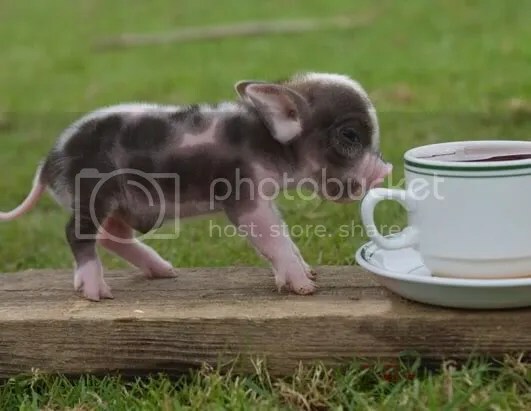 One thing my teacup pig will not have to endure is playing dress-up (apart from maybe something warm for the winter, but I haven’t really read up on their needs yet). Putting hats and frilly dresses on them seems unnecessary. 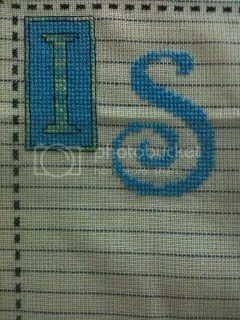 When I got into cross stitching again and found the big online community I discovered a (for me) new thing, SALs. 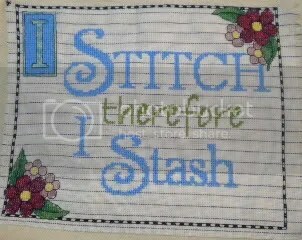 SAL stands for Stitch-A-Long and is used for when two or more stitchers get together and stitch one design. Recently one of the members on CSF (Crossstitchforum) found a great SAL design in Cross Stitch Crazy, and arranged a SAL. I wasn’t originally going to join as they don’t sell Cross Stitch Crazy in AD, but Kell, who stitched her’s very quickly, was kind enough to send me the chart. I decided to use some of the 14-count waste canvas I’d just bought and stitch it directly on to one of the bags I bought in Bangkok. It might not have been the best choice; the ready made bag is canvas so it’s hard to get the needle through the fabric, and it get’s very uneven for that reason. 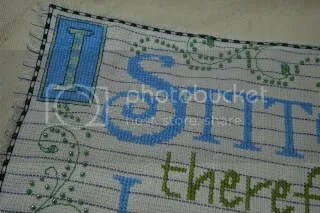 It’s also quite hard to stitch going in and out of the bag. First and last time methinks, at least with a design this size. I haven’t managed to finish it yet, have to give my fingers a few days rest between each stitchy time, but here are a few pictures of my progress up to the beginning of June. Will post another update in a few days. 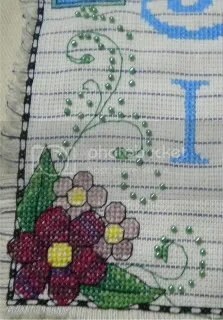 All the words done, most of the border with backstitch and some of the flowers in the corner. the yellow in the flowers were later frogged and replaced with two paler yellows. I’m having a hard time stitching it because I want to get to the end and pull the waste canvas out, I have no patience what so ever. Once I’ve finished this project I’ll let you know what colours i used, think the leaves might be the original ones, and the black but everything else has been changed. As I think I’ve mentioned I’ve joined a Christmas Round Robin as well as the unthemed one. This one is a little special in that we will have two themes within the wider theme of Christmas. 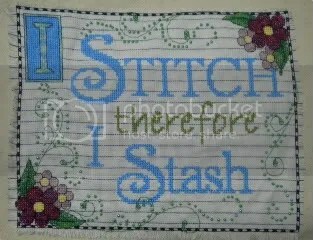 The first one the piece owner chooses, and two more squares are stitched with this theme. 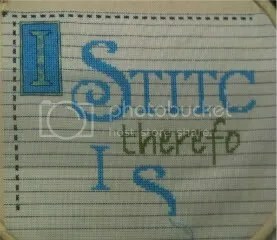 The second theme one of the other stitchers decide and two more stitch this theme as well. So when you get your piece back it will be a bit of a surprise to see what other theme has been chosen. For my piece I chose Christmas trees as my theme, and here is what my contribution looks like. It’s a freebie from a French blog, which you can find here. I stitched it using Dragonfloss – 206 Wood Elf and Dragonfloss – 212 Blood Ruby, 1 over 1 on 28-count pearl flecked white brittney evenweave. 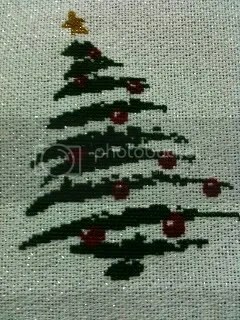 If I was to stitch the tree again I think I might go with a lighter green, Wood Elf looks very dark, but all in all I love it. I’ve got a better picture on my camera, this one was taken with hubbys iPhone so the quality isn’t all that, and I’ll swap them as soon as the camera ones have been loaded up. It was my first experience with brittney, and while I didn’t love it as much as 25 count Lugana it was still great to work with. the problem I had wasn’t with the holes being to small, more that the weave seemed more uneven than lugana. Maybe it’s the weaved in sparklies fault. I did try and add extra sparkle, with blending filament on the baubles but even with blending filament it was too bulky over 1 on 28 count. Plus the fabric sparkles enough I guess. When I moved to Liverpool I started buying The Guardian newspaper, not because I wanted to appear cleverer than the other students (ok that might have played a small part), but mostly because they had a special price for students. If you didn’t already know, students love a good deal. Anyway through daily reading I fell in love with the paper, and had a few regular columns I just had to read. Amongst those were Pass Notes, a series in G2 with a Q&A kinda take on the issues or interests of the day. Seriously, the topics were beyond broad, although if a politician had done something stupid (and they always do), you’d know he’d soon be starring in the column. Well I was only a reader for a couple of years before the series was axed (same time as they changed to the Berliner format I think), and while I still loved The Guardian my day was just that little less bright. Then of course we moved to Abu Dhabi and I stopped reading the paper. Only recently did I start reading it again, online through hubby’s iPhone, but Pass Notes was all but gone from my mind. Then today I found them again! Yippi!!!! And what’s more it came back in September 2009 which means I have 174 pass notes to catch up with! Don’t say: You sentimental fool! While browsing the Guardian the other day I came across a column I used to love reading, the Let’s Move To… series. I just love seeing these little gems they’d pull out of the real estate bag. A few weeks ago the highlighted location was one of my dream ones, a little village in Dorset. Ever since my year in Bournemouth, when I worked as an au pair, I’ve been in love with the area. While I’ve never actually been to Wareham, the location in the article, I’ve been to other villages like it and it sounds perfect. It’s nothing but a dream though, I doubt we’ll ever actually end up down there, but a girl can dream.Right? 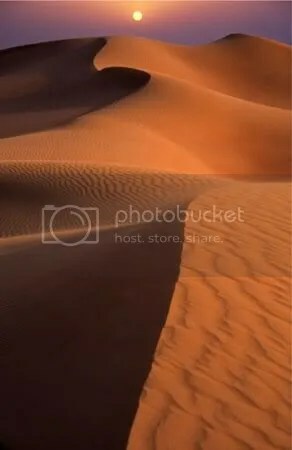 I do have other dream locations in mind, but I’ll tell you about them some other time. 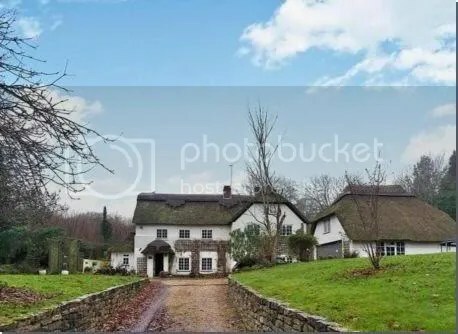 I feel I should add that if you would like to steal my dream home, it’s listed with Savills in Wimborne. I will of course hate you forever and then there is the bad karma, but with a house like that I’m sure you won’t care. After seeing A Knight Tale many moons ago my friends and I started saying saying the above, it stuck for a few months and when ever I am in pain I remember the quote and hanging with my friends, and I feel a little bit better. Today’s pain is not too great, just very sore muscles. Yesterday my friend and I had our first riding lesson in a month, and instead of a lesson in the paddock we went hacking in the desert. It was fantastic! Being out in the open was MUCH cooler than riding in the paddock, I mean it was hot, but nowhere near as bad as our lessons a month ago was. And the horses loved it as well, they were excited from the moment we rode away from the paddock and the muscle soreness stems from trying to hold mine back. It was a great change, usually he is really slow at the beginning of lessons and only perks up after the first canter. Yesterday he was powered up from the beginning though, the first canter I though he was going to run all the way to Dubai with me. But after the first struggle he was well behaved for the rest of the trip, as long as I kept the reins short and thight. So I don’t really mind the soreness, it was definitely worth it.